October 20, 2016 – Chicago, Illinois. 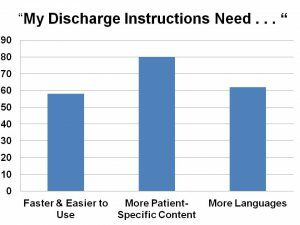 More than 60% of emergency nurses want improved discharge instructions! Discharge 1-2-3 surveyed nurses at the recent ENA Scientific Assembly in Los Angeles about discharge instructions used at their hospitals, and 140 responded. The order of concerns, and big Take-Aways illustrate an extremely consistent pattern. Though some users were more or less satisfied with their specific EMR the rank order was always the same. What were the nurses’ biggest complaints about discharge instructions? What EMRs Did These Users Have? The survey asked nurses which EMR they used at their hospitals. The most frequently named systems were Epic, Cerner, and Meditech, which mirrors national market rankings. Picis, McKesson, and Allscripts were also used by multiple respondents. Take-Away #1 – Nurses Want More Patient Specific Content! When asked which specific aspects of their discharge instructions they would like to see improved, nurses primarily answered: 1) more patient-specific content; 2) more languages; and 3) faster and easier to use. These biggest three concerns far outweighed others. Take-Away #2 – Rank Order of These Topic Concerns is the Same Regardless of Which EMR is Being Used. With only a few exceptions, these rankings are not significantly different when responses are broken down by EMR. Compare the proportion represented by each colored segment in the count of respondents below. 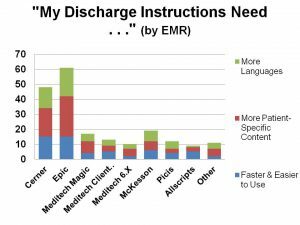 Epic users tended to be more satisfied with their discharge instructions than users of other EMRs. 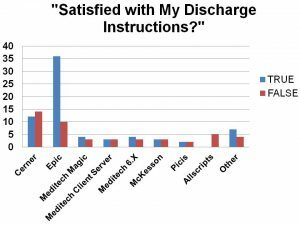 When asked whether they were satisfied with their current discharge instructions, over three-quarters of Epic users responded in the affirmative. 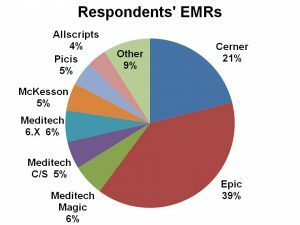 Respondents were not nearly as happy with other EMRs. Yet even for these more satisfied users as indicated in the preceding graph, “More Patient Specific Content” was the most common thing they wanted. At Discharge 1-2-3™, we frequently hear complaints from clinicians about other vendors discharge instructions. Although the sample size of this survey was small, the results confirmed the gaps we continue to see in the discharge instructions market. Discharge 1-2-3’s Composer™ software makes it fast and easy for clinicians to create patient-specific discharge instructions in multiple languages fast and easy for clinicians. These findings do not surprise us. Do they surprise you? Can Discharge 123 merge with Meditech to create a medication reconciliation or make one itself?